The Lilly Belle Steam Train has been circling the Magic Kingdom since the park opened in 1971. However, due to some mechanical problems, it has been out of commission for the last four years. 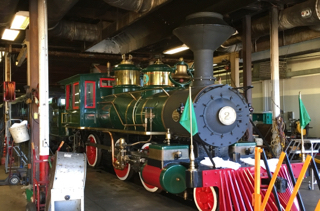 It is now preparing to re-enter service in the near future, and I was able to take this shot in the "roundhouse" while on a backstage tour a few weeks ago.